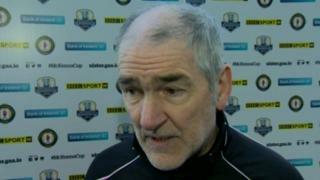 Mickey Harte says he is happy that his players have prolonged their Dr McKenna Cup run as they defeated Antrim on Sunday although he acknowledges that a possible three games in six days may not be ideal. Tyrone set up a semi-final meeting with Armagh at the Athletic Grounds on Wednesday night by beating Antrim 1-11 to 0-7 on Sunday. Harte was pleased with Tyrone's build-up play against the defensive Saffrons outfit but felt his team's finishing had been poor.